We’re all friends here, right? Can we admit to one another that we’ve pinned a $300 vintage bar cart, as if an expensive piece of furniture whose sole purpose is to house bottles of alcohol is a totally justifiable thing? Good. 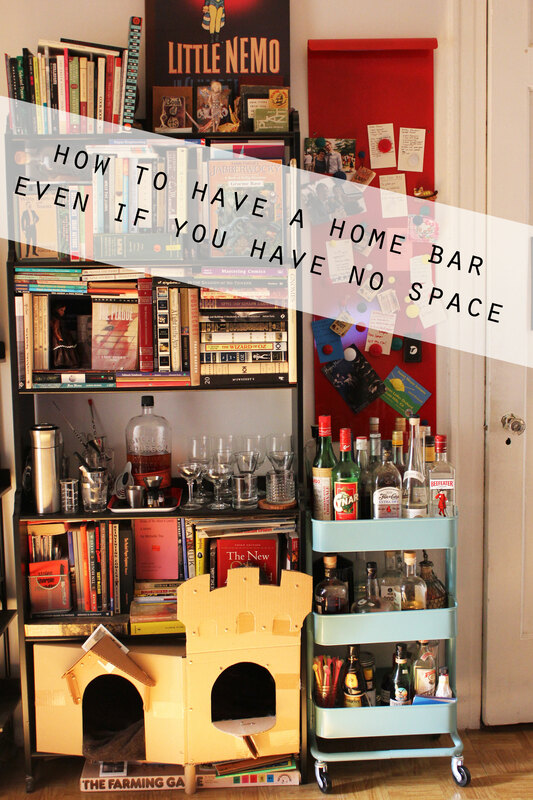 Now that we’re all on the same page, grab a drink while I tell you a little bit about how I came to have a home bar that I was happy with in my 1-bedroom apartment for waaaaay less than $300. Think outside the bar cart: When researching various bar carts and bar furniture, I found that anything that had the word “bar” in front of it was pretty much always overpriced. So, I started looking around at kitchen and bath carts and became OBSESSED with the RÅSKOG (pictured above) from Ikea. I saw it on—you guessed it—Pinterest before it was even released and had a number of epic failed attempts before I was able to track it down. Although having a bar cart for $50 in my favorite color ultimately made it worth the effort, a little birdie told me it’s becoming much more widely available and can even be ordered online now. Use what you already have: As you can see in the picture at the top of the post, we cleared off space on a bookshelf that is adjacent to our bar cart to store glassware, cocktail shakers, jiggers, etc. It might seem a little weird to have some dishes on a shelf in your living room, but adding accents like trays and coasters and moving all the prettiest glassware to the front makes it seem less like awkward storage and more like a home bar. For another example of this, I love what Megan from Stetted did with her home coffee bar. 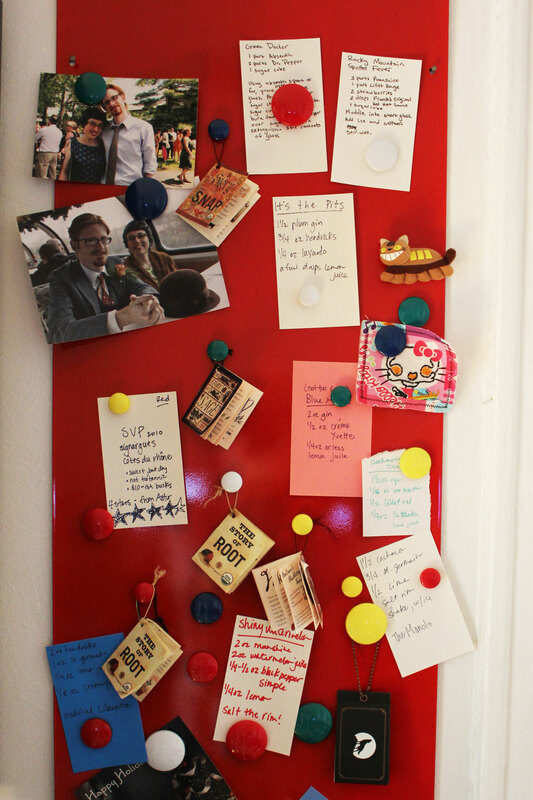 Make a menu: We hung a simple magnet board—also from Ikea—behind the bar cart and stashed a little pile of index cards between bottles on one of the shelves. This way, when we make a new drink, we can easily jot down the ingredients, put it up on the board, and refine or recreate it later. Over time, this “menu” becomes a fun way to offer indecisive friends drink options too. 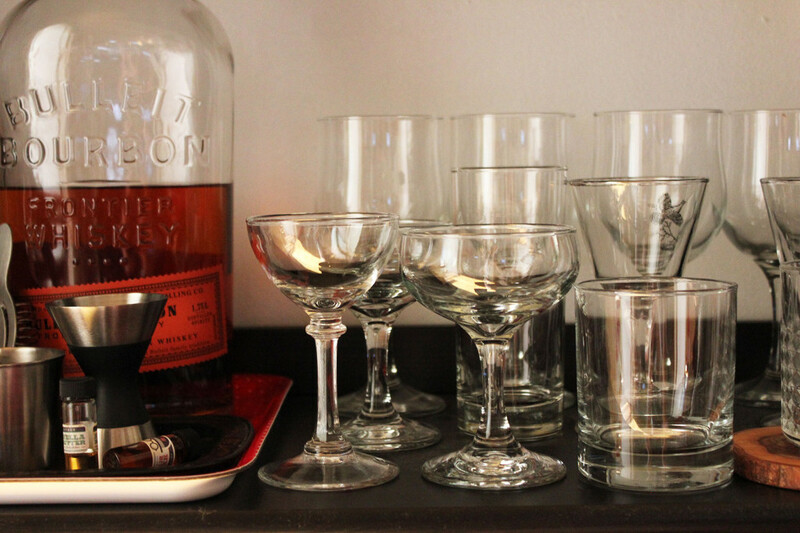 We’re still working on getting the bar cart fully stocked, but this “How to Stock a Home Bar,” guide from Good. Food. Stories has been super helpful. 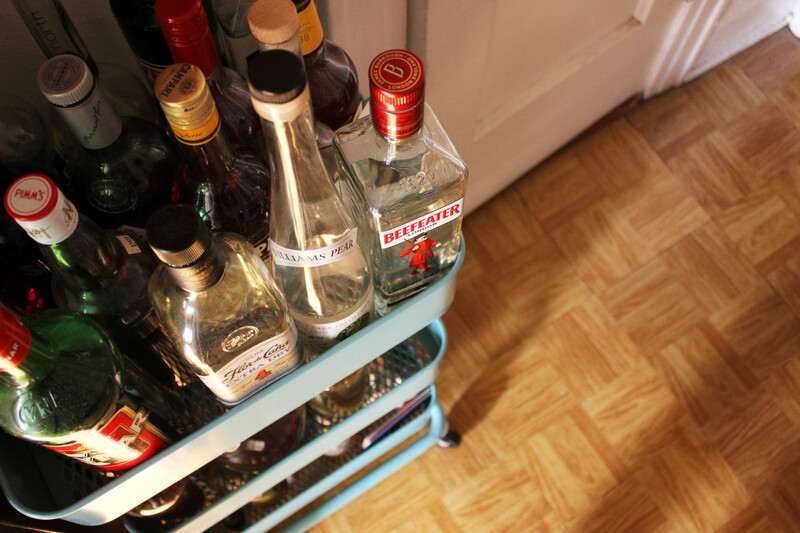 I also want to try to adjust the shelf height on the bar cart to maximize storage. It’s definitely still a work in progress, but we’ve come a long way from a couple bottles on the kitchen floor. Aww. Thanks Sarah! Yeah, it’s definitely not a kiddo proof situation. Now my husband is comparing our stock. Even though we have a whole house, it’s a SMALL house and I still pine for a cool vintage bar. I love the menu board idea – so much cooler than my ugly college-style dry-erase boards stuck on my fridge! Ooooh, love this! We just moved into a new, tiny(ish) house and right now our bar stuff is hiding in a cabinet in the kitchen #sadtimes. 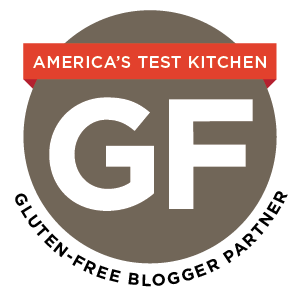 This would be a great way to make it more front and center (the hubs would love it, too, for sure)! Congrats on the new place, Stephanie! Booze bottles are usually pretty enough that you can totally get away with putting them on display. It’s so funny that you posted this (and that I got to see this in person on Saturday!) because I meant to ask you last week on the podcast how you fit all of your bottles and glasses in your NYC apartment! Now I have the answer… and you make it seem as though a) I should really better stock my bar (I don’t even have vermouth!) and b) I have plenty of space in my kitchen so I don’t have to store my booze on top of my cabinets as if I’m still in college. This is incredibly pinnable so I’m going to do just that to help other cocktail-challenged folks like me! HA! “incredible pinnable.” You know that made me laugh. Mine were in the kitchen before too and there just really wasn’t space for them. Plus, they were taking up prime kitchen real estate. The cart was my solution to that. You didn’t mention that every good wet bar has a cardboard cat castle. ^^he’s got a point. I think Paul should guest post about how to build cardboard cat castles in small spaces. This is perfect. Also, the cat castle is awesome. I love it, Emily. I totally support putting it on your treatyoself list. This is such a great idea Autumn! We’re small house dwellers with a kiddo + so our bar of sorts is on top of a vintage white metal cabinet inside our open kitchen pantry. Although one of these days, I hope to turn a vintage trunk on its side or find a sweet cart to set up a stocked bar (with a menu board).